Liver filters the blood circulating through the body and it is likely to come in contact or get affected by the cancerous cells running through the bloodstream. These cells can harbor in the liver and start to grow. The cancer that begins in any other part of the body often spread to the liver. The liver has the ability to regenerate which in the case of cancer results in the development of cancer cells. The cancers develop because of damaged DNA of any cell. These cells become cancerous and initiate cancer in the body. The liver cancer causes are not clear yet, however, there is some known risk factor of the cancer. Risk factors affect the chances of having a disease. Different diseases have different risk factors and below given risk factors increase the chance of getting the cancer. Males are more likely to have liver cancer than in females. However, some types of liver cancer are found more in women. Some global stats show that the percentage of people getting the liver cancer is high in Asian Americans and Pacific Islanders followed by the American Indians or Alaska Natives and Hispanics or Latinos, African Americans, and whites. 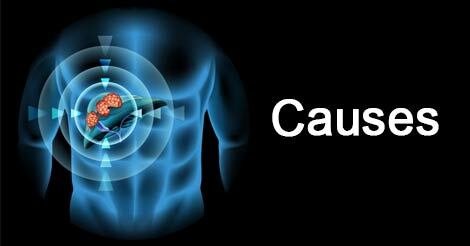 It is the most common risk factor of liver cancer that can be included in the list of the liver cancer causes. It is caused by the long-term infection with hepatitis B virus or hepatitis C virus. These infections lead to cirrhosis (a chronic disease of the liver marked by degeneration of cells) of the liver and also, are responsible for the liver cancer becoming most common disease in many parts of the world. It is a disease caused by HBV or HCV infection, in which the liver cells gets damaged and/or replaced by the scar tissues. Cirrhosis is a high risk factor of the cancer and often it comes out that people suffering from liver cancer has evidence of cirrhosis. Consumption of alcohol is leading cause of cirrhosis which is directly linked to liver cancer and can be one of the biggest liver cancer reasons. Obesity can result in fatty liver disease or cirrhosis which increase the risk of developing the liver cancer. The blood sugar disorder increases the risk of liver cancer. The other reason of its being the risk factor is that the type 2 diabetes causes obesity, which in turn can cause liver problems. Aflatoxins are cancer causing elements that are created by fungus in the food like peanut or soya. These are the male hormones used to increase the strength, mass and stamina, especially by the athletes. These steroids increase the risk of hepatocellular cancer. Knowing that you have a life-threatening condition can be overwhelming and devastating. So, it is best to have a keen eye on your health and discuss with your general physician if you notice any signs and symptoms of the disease. In conditions like liver cancer, precise causes are still unknown, but knowing the symptoms and risk factors can help to detect liver cancer in early stages. Master health checkup by Indus Health Plus can aid in preventing such diseases as you receive detailed insight into your health status. To connect with us fill up the query form.